An enhanced version of our popular ARINC 429 to 2-Channel Relay converter, except that this converter contains 8 discrete volt-free relay contacts with additional options. Providing both the ARM and Contact of the relay onto the I/O connector thus allowing the installing agency maximum versatility. This converter will monitor the individual bits of two selected ARINC 429 Labels and use this information to control the state of up to 8 volt-free relay contacts. Each relay contact is dependent upon a discrete bit within a user selectable ARINC 429 Label. If the discrete field bit changes state then a corresponding relay contact will switch state also. Two user selectable ARINC 429 Labels settings are possible via DIP switches mounted on the PCB. Each relay can be mapped to either the first or second Label (A or B) in any combination. eg. Four relays mapped to Label A (1st Label) and four to Label B (2nd Label) OR all eight relays mapped to one Label. The SDI and SSM values for each Label are selectable via DIP switches or the values can be to "Don't care" whereby the SDI and/or SSM values will be ignored. Each relay state can be configured independently to be normally open or normally closed via its respective DIP switch. The PCB contains LED's that indicate whether the received bus is low speed (12.5 kHz) or high speed (100kHz) and whether Label A and/or Label B are being decoded. FPGA ONLY architechure - No microprocessor - RTCA DO-178B not required. All units are designed to meet the European, US EMC regulations and RTCA DO-160G. The ARINC 429 to Relay Output converter is powered from an external 28 VDC (15-72V) nominal supply with internal current and thermal (102 ºC) fuse. The inputs are opto-coupled for electrical isolation purposes. The ARINC 429 label and discrete bit field within the label can be set up so that when this bit changes state the relay contact switches from normally open to closed contacts. The relay contact is only available as "volt-free". The operation of the relay contact can be either open or closed if the monitored bit is set. This is set up via a DIP switch on the PCB. The discrete output can switch back again once the discrete field returns to the original state. 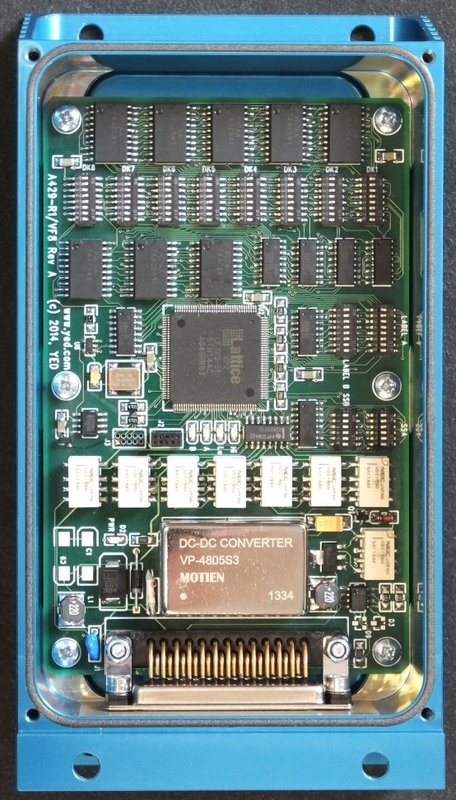 FPGA ONLY architechure - No microprocessor - RTCA DO-178B not required. All units are designed to meet the European, US EMC regulations and RTCA DO-160G. The YED/429-R1L2/VF8 attaches to the airframe via four mounting holes. Protected against voltage spikes and brown-outs. Power on reset using power supply supervisory device and watchdog timeout. ARINC 429 input with automatic High/Mid/Low bit detection (100/50/12.5kHz). Any two of 256 Label combinations. 500mA @ 28 VDC (non inductive load). Operating temperature range…...…....… -40 to +85 degrees C.